Despite the 1918 threat of Spanish Influenza, amid fall leaves, turned russet and gold, the first Tuesday in November people drove wagons, rode horses, and walked to the school house to cast their votes in the annual election. A few even arrived in automobiles. Democrats won the county offices. All but four with nice majorities.1. John Francis McKay, a Non-Partisan League member, was the most bitterly fought campaign in the west end when he sought the office of state senator. Noxon voted 81-McKay, 52 for his opponent, Dwight. His daughter, Ruth McKay Tauscher said he was elected from Sanders County in on the Populist platform. "He was first to introduce an eight hour day in the senate in Montana," Ruth McKay said. And first to propose an old age pension. Fellow politicians thought it was crazy, all those old men in Helena talked against it, you know. "These became John Francis McKay's early demands, and he addressed the issues on his speaking tours. Outspoken, honest and direct, he expressed himself with clarity, conviction and sincerity, and at every opportunity he spread his philosophy. "As editor of the (Whitefish, Montana) paper, he wrote constantly on the weakness and strength of the human being in struggling with the evils of capitalism, and lecturing on democracy. "He barraged the public with intensity to create an awareness of the problems within the political and social system. Eventually he felt betrayed by many politicians and referred to the Democratic Party as a 'clearinghouse' for a multitude of problems. McKay felt the party became a conglomeration of cliques, gangs and factions devoid of any sort of moral principal."2. A look at John Frances McKay's origins, education and the influencing events in his life are helpful in trying to understand the pressures he would wield. According to family legend, his father, John Henry McKay, came from Scotland, aged 19 as an enlisted man in the English Army stationed in Quebec. He fled the armed services in Canada following a duel with an officer. Both of them were drinking. McKay was known to be a good swordsman.*3. The officer was, too, and he resented a rank and file soldier being considered possibly as good. The two got to fooling around. Half in jest and half in challenge, they were dueling with buttons on their swords (a device over the end of the swords so they wouldn't cut.) Jest turned to anger. The officer pulled off his button and dealt McKay some nasty slashes on his face. McKay retaliated. The duel turned ugly. In the tradition of the army, it was intolerable that a rank and file soldier would in any way engage an officer. McKay fled the army and the country, crossing the St. Lawrence River into the United States. In Illinois he worked as a transit man on the NPRR, surveying west with it to Plains, MT where the railroad was finishing up its line. J. H. McKay met and married an Irish immigrant girl from county Cork, Annie MacGowan. The young family settled in Thayer, Iowa where John Francis McKay was born. He had two sisters, Annie and Janet. Annie died at 15 with pneumonia. Janet grew up and married Fred Mass, a conductor on the Northern Pacific Railroad. John Henry and Annie homesteaded at Eddy, MT. John Henry was a rather conservative man without strong political beliefs. However, his wife was free-thinking, with fairly strong political opinions. Although not politically partisan, she was skeptical of the status quo. The family was Catholic. Two of their children, including John Francis, were born in the depot at Eddy, attended by the doctor from Thompson Falls. In 1892 John Francis was sent to Gonzaga University in Spokane, Washington., at the age of eight, for his education. The University was a boarding school then. He was a brilliant student, given books to study, then progressing at his own pace. He was a very devout Catholic when he was a young man. There was a Catholic church in Plains. When he was about 17 years old, he worked in the Butte mines. He was always a thinking man, even as a young man, thinking of the issues of the day. He had a falling out with the Catholic Church because the bishop in Montana went along with the Montana Power Company. Of course they'd get donations (the church) ... McKay was told to back away from attacking the Anaconda Mining Company and the Montana Power Company, who ran the politics of the state. Very young in life he began questioning the church on some of their stands. Or the local church bishops. He didn't go along with the powers that be just because they where the heavy donors for his church. "If you don't hassle too much about the hours that they work the men or the pay, or this or that, they see that the church is supported," the bishop in Butte instructed him. From then on J. F. was self-taught, developing a library of history, law books, philosophy. He was an ardent student, ever ready to discuss the political issues of the day. John Francis became a telegraph operator and agent for Northern Pacific railroad. He met Christie Agnes May, also a Northern Pacific railroad telegrapher, when she was stationed at Eddy, Montana, and boarding at his mother's home. In old report cards, Christie in high school, at Plains, Montana, never received any but high marks, as they used to say. She was holding down a telegrapher position at 17 years old. She and John were married when she was 19. Their living quarters were in the back of the depot. McKay was logging on Smeads Bench, west of Noxon in 1913, having a good-sized logging camp there. In 1914, he met up with Clifford R. Weare, a storekeeper at Noxon who was just quitting business and relocating to the northside of the river to take up a homestead. Weare, always interested in "settling up the country" urged him to think about homesteading, taking him up into the Dry Creek drainage on the north side of the Clark's Fork River five miles east of Noxon. "I put McKay on a homestead up on Dry Creek," Weare said.4. John Francis took Weare at his word and in 1914 went up in Dry Creek, picked out a good place for a home site, built a cabin and filed a claim on it, the first settler to take up a place on Dry Creek. The name of the creek then changed to McKay Creek. But homesteading was perilous for men with small children. "1914, the year I built my house, Jamison and I," Weare said, "John McKay was up McKay Creek. I told him, 'My God, John. You can't stay up here this winter.' He didn't have no team nor anything. 'Come down and live with us.' We just had two rooms. One upstairs and one down. Hahaha. They come down and stayed that winter with us. They had three kids then. We had Buster and the our girls."5. McKay returned to the homestead the following summer. The McKay children's first school experience was at the Evergreen school, a one room building with eight grades approximately five miles east of where their ranch in Sanders County. "With three older brothers in the upper grades listening to every mistake I made, my life was sometimes made miserable on the long drive home," Ruth McKay said. "We had a horse and light buggy, which was stabled at the school in a small barn.6. "There was no Catholic church at Noxon. Once in a while the priest would come through but usually dad was out on a logging job or something. "My mother's father, Charles F. May, lived with us for many years. He had a beautiful team of horses of which he was so proud. If you had a good team in those days there was always some work to be had. When we lived on the ranch the roads were so muddy and hill so steep that he and father picked up quite a sum by pulling cars up hills or out of mud holes in which they became mired." "But one day a fella came in there, all dressed up, and looking around the place. Came to the door and asked quite a few questions. And he says, "Do you know that you folks are living on a railroad section?" Fred Minear recalled. 7. It was Northern Pacific Railroad land. McKay had to move his family out. He then took a homestead six miles east of Noxon, and then left it to go to Thompson Falls. "A huge three day picnic was staged at Alger, beginning June 26, to celebrate the soldiers and sailors return. It was quite the most successful and largely attended event ever staged in this part of the state. "To the Alger Marketing Association belongs the credit of the affair as it was their planning and accomplishment. 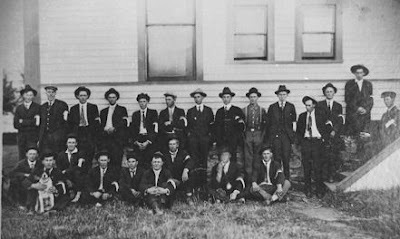 It is very safe to say that never, in Montana, at least, have soldiers and sailors enjoyed the hospitalities of a community for three days. For that period Alger provided everything for them in the way of food, bedding and entertainment. "A canteen was conducted by the Red Cross officers in uniform and three hot meals were furnished free to the veterans. Blankets and tarps were provided for sleeping. Athletics of all kinds were planned for the day amusements and a dance each evening, the music for the latter being furnished by the Baily Orchestra of Thompson Falls, assisted by Soldier Blackman of Plains. 'Friday was Dairy Day ... Saturday, Children's Day. Watch Sanders county grow." Green, and niece, Agnes Jenkins. Soon, the returning service men affected politics and labor in the valley. Because of the political disputes over the silver issue, prices skyrocketed. Silver became an unattainable commodity the spring of 1918 even at $1 an ounce, spurring prospectors up the forested slopes. Holbert, Freeman, Lyons, Weare, and every man they could persuade to swing a pick or wield a shovel to expose what the minerals they believed lie buried all around the area. Tunnels were lengthened; new prospects were opened; yet wealth eluded them all. In the Bull River valley, back of Bull Lake on Scotchman Peak, Ed Strom filed claims on a prospect he was very excited about.8. Yet the thorny problem of transportation continued to goad the homesteaders. Good roads affected their jobs, but more importantly, in getting their products to market they were severely hampered. Sanders County, along with 30 other counties would be holding a special election, September 2nd, to vote bond issues for road purposes aggregating six million dollars, according to figues made public by the state highway commission. The government was expected to put up five and a half million on road projects in Montana ... if the state would meet that sum in the matching fund system. These great totals were hoped to help the unemployment problem. Sanders county would vote on $75,000.9. All across Montana the cry went out. Many central and eastern Montana farmers needed employment due to drought. Thirty-three counties were to vote on a five-mill bond for roads. The upcoming election to build roads was a controversial topic. Not everyone saw self-imposed taxing as the best way to cure the problems. "Modern industrial society is divided into classes-those who possess and do not produce and those who produce and do not possess." Sanders County Independent Ledger editor spelled out his feelings concerning the labor and union struggle, the 'one big union' movement in America. "The plan provides for industrial revolution pure and simple to enforce the demands of every labor group... Conservative and level headed labor leaders know such a plan can never win in the long run but they also know that in attempting to carry out the plan, the radical element stands a very good chance of bringing wreck and ruin upon industry and poverty to the laboring man. "The "one big union" is simply the American phrase for Bolshevism the main object of which is to take from those who have saved and accumulated anything, and turn industry over to mob rule. When the dividing up process is over, industry is wrecked, the people penniless and there is no employment. "...Wages in the west are high, higher than in any other part of the world. Industry can pay just so much and when the cost exceeds the profits it must close. You can't get blood out of a turnip, neither can you get wages out of a bankrupt business..."
"The war has demonstrated the value of good roads from a military standpoint and now, during the reconstruction period, is a most opportune (way) to furnish employment in carrying on this work".10. That September, in Sanders County the bond issue carried by 8 to 1 and the 5 mill extra levy for bridges carried by better than 3 to 1 county-wide. Noxon cast their 101 votes 100 per cent in favor of the bridge levy, and 97 for and 3 against the bond issue. Of the 17 districts voting, five were overwhelmingly against the bridges. Heron was one of them, voting two to one against it and giving an 18 to 17 vote against the bond issue as well.11. The Bureau of Roads survey and "construction cost based thereon for a road sixteen feet overall width was estimated at $557,000. It was to be designated Forest Highway Route #6 extending from Plains to the Idaho state line.12. Although Germany had accepted President Woodrow Wilson's terms for peace and recalled their submarines on October 20, 1919 fighting continued. November 14, Noxon learned World War I was ended. The Armistice had been signed November 11 in Marshal Foch's railway coach, near Compeigne, France. The bugles had sounded, "cease fire" at 11 a.m.13. Noxon men gathered at the schoolhouse for a Community Club meeting. Courtesy Blanche Gordon Claxton collection. "The west end, from Plains to Heron, from which territory at least two thirds of the taxes of the county are derived", was not represented on the board of commissioners ... for quite a time. John Francis McKay was appointed county Commissioner to fill a vacancy. "No one who is fair minded can justly criticize this appointment, especially as Mr. McKay is an old time citizen of the county, a good business man, honest and upright, which he showed when deputy county clerk and recorder, and has hundreds of friends who know that he will make good," the editor of Sanders County Independent Ledger assured readers.14. Certainly gossip spread the word the word about so prominent a resident as John F. McKay, who went to Whitefish in 1920, and in 1921 the railroad strike ended his newspaper work. 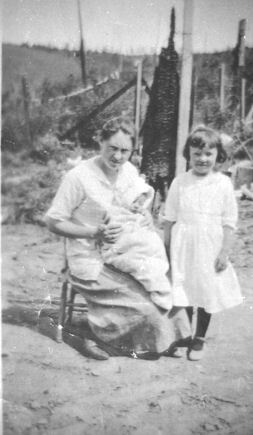 Many old friends in the west end welcomed them when McKay moved his family back to Noxon, with his father-in-law. John had ten children, using them as his audience to expound on his political philosophy and his economic philosophy. He was very much a man to test his ideas on neighbors and friends and anybody who had occasion to visit his home, or work with him on the job. McKay got so busy preaching Democratic standards that he lost his printing business while concentrating his total energies on politics.15. Sanders County Independent Ledger, November 7, 1918. Ruth McKay Tauscher, tape-recorded oral history, 1983. McKay children and their occupations: John Charles, President of Cenex, St. Paul, Minnesota. Francis, teacher at Gonzaga University, Spokane, Washington (deceased) Maurice, Director of Group Health, St. Paul, Minnesota; retired, Hope, Idaho. Ruth Tauscher, realtor, political involvement, Spokane, Washington. Thomas, schoolteacher, Curlew, Washington. Ann, farming, Chewela, Washington. Bob, Carnival owner, Spokane, Washington. Rose, egg ranch, sailing south pacific, Seattle, Washington. Patricia - International Harvester, 30 years, Portland, Oregon (deceased). Gene, owner of engineering firm, Spokane, Washington. Ruth McKay Tauscher, 1986 - Spokane, Washington. To Educate the People along political and economic lines. To secure for the Producer the largest share of the Wealth he creates, and by so doing, raise the Social, Moral and Intellectual standing of the entire Community. To place Representatives of the Producers in all the Departments of the Municipal, County, State and National Government. The Public Ownership and Democratic Control of Basic Industry. Clifford R. Weare, tape-recorded oral history, March 10, 1970. Ruth McKay Tauscher, tape-recorded oral history, 1986. Fred Minear, tape-recorded oral history, February 1, 1990. Harry Talmadge tape-recorded oral history, 1971. After Strom died Cliff Weare filed on them. Later sold them to Kennecott. First claims sold to later be developed as Troy Scotchman Mine by ASARCO). J. P. Morgan formed the Kennecott Copper Corporation in 1903. Sanders County Independent Ledger, July 24, 1919. Federal Highway Department, letter, March 24, 1972. John F. McKay is my Great Grandfather and I am so interested to learn more about him! While researching for this northwest Montana regional history series it was my pleasure to interview several members of the McKay family. Some of them also graciously allowed me to copy and publish photos from their family albums. So I store the negatives, as well as the oral tape recordings of those interviews. CD copies of all the oral tape recorded history are also located at Eastern Washington State Historical Society, Spokane, WA, and at Montana Historical Society, Helena, MT. Thanks for commenting. I'm always absolutely thrilled when I learn kin to any of the characters in these books find and enjoy learning about members of their family tree.